A US start-up has turned to nature to help bring water to arid areas by drawing moisture from the air. NBD Nano aims to mimic the way a beetle survives in an African desert to create a self-filling water bottle capable of storing up to three litres every hour. The insect harvests moisture from the air by first getting it to condense on its back and then storing the water. Using nature as an inspiration for technology, known as biomimicry, is increasingly widespread. 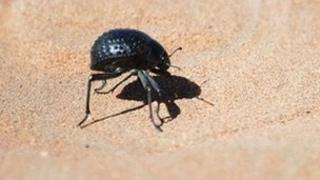 NBD Nano, which consists of four recent university graduates and was formed in May, looked at the Namib Desert beetle that lives in a region that gets about half an inch of rainfall per year. Using a similar approach, the firm wants to cover the surface of a bottle with hydrophilic (water-attracting) and hydrophobic (water-repellent) materials. The work is still in its early stages, but it is the latest example of researchers looking at nature to find inspiration for sustainable technology. "It was important to apply [biomimicry] to our design and we have developed a proof of concept and [are] currently creating our first fully-functional prototype," Miguel Galvez, a co-founder, told the BBC. "We think our initial prototype will collect anywhere from half a litre of water to three litres per hour, depending on local environments." The founders want to use a fan to get the surrounding air to pass over the surface of the bottle. The air would then condense and get stored inside the device. "Dry places like the Atacama Desert or Gobi Desert don't have access to a lot of sources of water," said Mr Galvez. "So if we're creating [several] litres per day in a cost-effective manner, you can get this to a community of people in Sub-Saharan Africa and other dry regions of the world. And if you can do it cheaply enough, then you can really create an impact on the local environment." About three billion people on Earth - almost one in two - live in water-scarce conditions, with demand growing drastically, while supply remains constant, according to the World Health Organization. In some countries, condensation devices on rooftops already harvest water from the air - but these technologies consume large amounts of energy to produce small amounts of water. NBD Nano's prototype seems to be more energy-efficient, but it still would not be able to satisfy the needs of an entire community, Erik Harvey from WaterAid charity told the BBC. "Even in water-scarce areas, communities need more water than what they would consume for themselves - livestock and agriculture in arid environments are very important," he said. But it does not mean the start-up is wasting time developing a water bottle, he said. "There is a range of viable markets for them, like the military or the outdoors market, people going camping, and the advantage that they may have is a much lower energy input device," said Mr Harvey. A number of companies have recently been researching nature-inspired solutions to real-life problems. Electronics firm Qualcomm studied light reflection on butterfly wings to design its Mirasol e-reader display. And Canadian company Whalepower mimics humpback whale flippers in its wind turbines and fans to reduce drag. San Diego Zoo in California recently opened a Centre for Bioinspiration. And there is a Biomimicry Institute in Montana, US, where consultants work with companies, helping them to apply nature-inspired solutions to particular problems.